Rustic Industrial design, characterized by reclaimed wood and galvanized metal accents, is a hot trend in today’s interiors. It has been creeping in to our design aesthetic for a few years, and with the social media enthusiasts on sites such as Houzz and Pinterest dedicating hundreds of pages to its cult, you know it is a trend with staying power. Wall detail in rustic industrial style from TooMuchTime.com. Why is this rustic, old stuff so popular? 1. In design, like everything else, the pendulum swings. 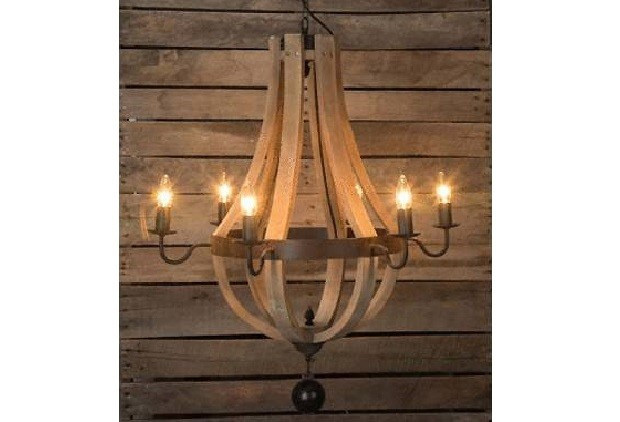 Rustic Industrial is a pendulum swing away from sleek, Modern design that has dominated for the past 15 years. Rustic industrial is not sleek, not modern, not polished and that is precisely what makes it popular. Rustic floor and wood table juxtapose with sleek modern colors and furnishings. Image from BlogHayneedle.com and photo credit by Purple Bow. 2. Friction. Despite its reaction against modern, Rustic Industrial is often paired with a clean modern look. The juxtaposition of the two looks creates lots of design ‘friction’ which we all love, even if we don’t know it is happening. Friction is a designer’s best friend. Wine barrel style chandelier at www.antiquefarmhouse.com. 3. It feels environmentally ‘green’. I don’t know that it actual is but with all this reclaimed, old timey material, it at least feels like it should be. Reduce, Reuse, Recycle, and the next thing you know, a wine barrel becomes a chandelier. 4. It has a good story. Who wouldn’t want to talk about their interesting book shelves that are modeled on a 1920’s warehouse designs, or that door found in an old barn in upstate somewhere or other? People love to tell stories about the things in their lives. A dining table can have a cool story or no story. I’ll take the good story any time. 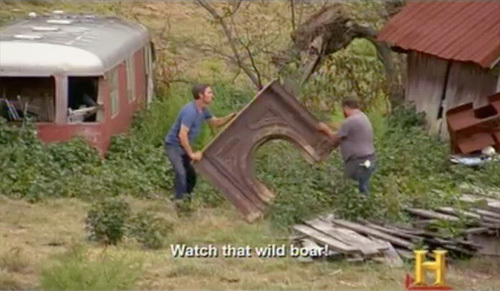 American Pickers finding a fireplace surround. 5. You can create it or find it yourself. Ever see American Pickers on TV? They find hidden treasures for cheap. Garage sales? Estate sales? We can be our own design heros and find those hidden gems. It isn’t just design, it is entertainment! 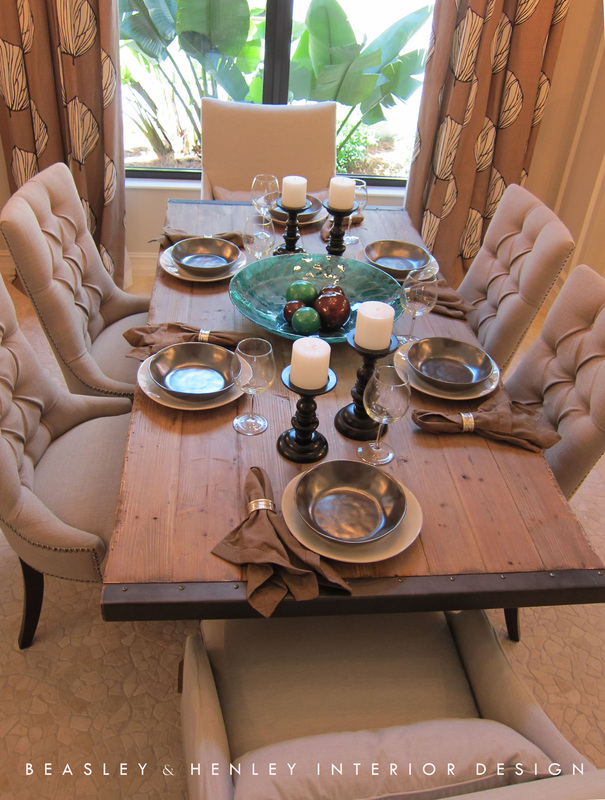 Vintage style Dining Table by Beasley & Henley Interior Design in Naples, Fla.
6. It is warm and homey and gives us a connection to the past. We are a mobile society often lacking permanence and ties to our past. 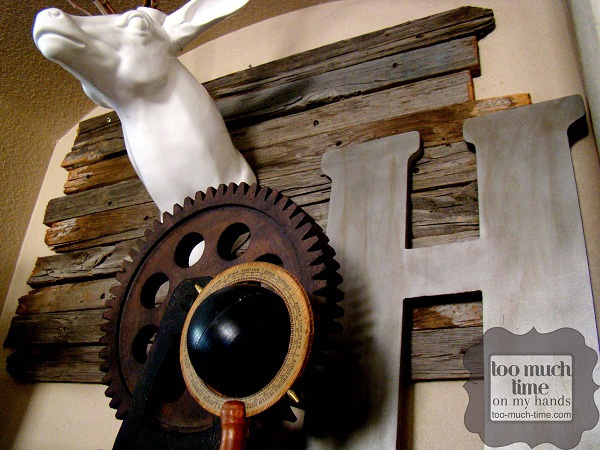 Rustic Industrial designs brings the early 1900’s into our home. Almost like grandpa left us that table he made himself or pulled it out of an old factory were our long dead but hardworking ancestors toiled. 7. Restoration Hardware. They really popularized this trend, so much so that people call it the Restoration Hardware look. They made it look great and we bought it. Thanks RH!